Summer is in full swing. That means hot days and homegrown tomatoes. However, this year all I am getting is cherry tomatoes. My Goliath tomato plant died. And my regular tomatoes are not much bigger than golf balls and they are few and far between. This has left me trying to figure out what to do with all the little tomatoes. So I came up with the following recipe. Cook spaghetti noodles in salted water according to package direction until al dente. In a large skillet heat olive oil until simmering. Add garlic and cook until softened (about 2 minutes). Add tomatoes and cook another 2 minutes. Add wine, bring to a simmer. Add zucchini and cook for and additional 2 minutes. Then add noodles. Top with fresh basil and serve. 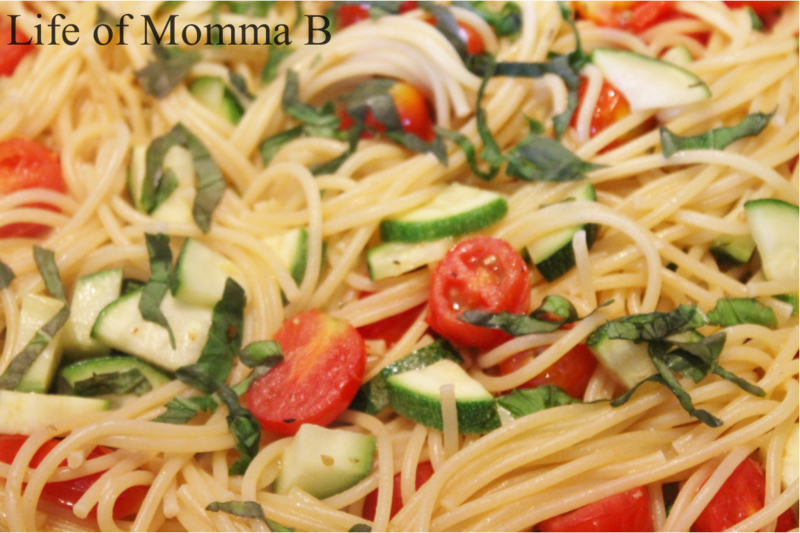 This entry was posted in Recipes and tagged dinner, pasta, printable, recipe card, tomato, zucchini. Bookmark the permalink.